The Harpy Eagle Harpia harpyja must be high on everyone's list of "most wanted birds in the world." It certainly was on the first such list that I made back in 1975, and it took me seven major trips into its forested Neotropical habitat to finally succeed. 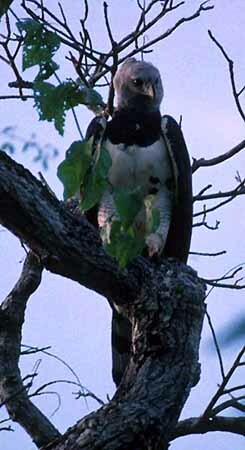 It surely ranks right up there with the Philippine (Monkey-eating) Eagle Pithecophaga jefferyi as the most impressive raptor on this earth [there is a link at the bottom of this page that takes you to my Philippine Eagle adventure]. 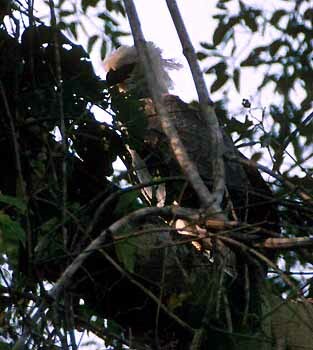 "Harpy Eagle -- adult at nest in large tree ... watched for 60 minutes... We did not know of this nest until yesterday, when Maria Teresa Coelho showed us a feather! The nest has been active for about 5 years, but the Coelhos (owners of Pousada Currupira das Araras) thought all birders would [already] know or that the bird was not important! Maria Teresa reported that the ground under the nest is littered with cacique nests! 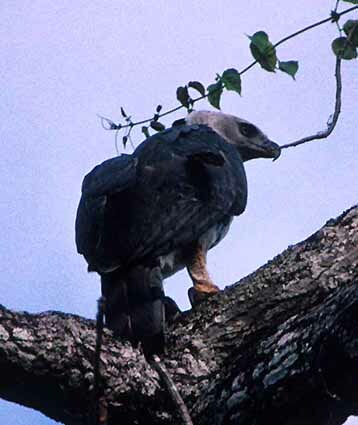 (suggests that the eagles rip nests off trees with occupants inside and carry convenience-wrapped snacks back to the nest!). An exciting and unexpected experience!" 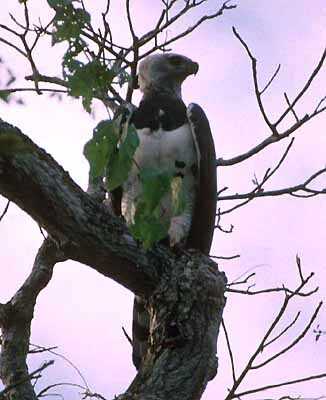 Rita & I were enthralled by Steve's stories, and determined right there and then to get to Brazil in time to see this Harpy Eagle nest if we could. For us that meant August 1999, and we arranged a private tour of the Pantanal, Serra das Araras, and Chapada dos Guimaraes National Park with Paulo Boute [you can, too -- check out Paulo's web site for details]. The Serra das Araras (above) are a small mountain range, in the state of Mato Grosso near Brazil's border with Bolivia, and from it flows the mighty Paraguay River that creates the great marshes of the Pantanal during flood stage. The southernmost fingers of Amazonian rain forest occur here, growing in the valleys between steep, forested mesas. Portions of the valleys are natural savanna and other portions have been cleared for cattle, creating a patchwork of forest and clearings. The Pousada Currupira das Araras has the lovely setting shown above; accommodations are comfortable bungalows; meals are wonderful (especially the fresh-squeezed orange juice at breakfast). The nest tree (left with Rita & I standing down below; arrow points to the eagle nest) is actually on the edge of a protected clearing, and reached by a short trail through the heart of the forest from the one bisecting dirt road. When Steve & Bill first saw the nest back in October 1998, they could not see any young but, from the parents behavior (bringing in small prey items) it was apparent there was a recent nestling. I knew from the literature that Harpy youngsters fledge at about nine months, which meant it was likely the eaglet would fledge in July, just before we visited in August. I also knew that juvenals remained around the nest site for another year or so, being fed by their parents about one a week, until they became independent. Indeed, Paulo told us via e-mail in late July that the fledgling was making short flights from the nest. When Rita, Paulo, and I arrived on 3 Aug 1999, the nest was empty. Paulo had been leading visitors here for months, always with success, but now the possibility of missing it loomed. Fortunately, Rita took charge and began scanning nearby trees, soon spotting the handsome youngster (below). It already had bits of a crest, and its only reaction to us was curiosity, peering down at us over the next hour. The parents did not appear. We figured that would be our experience -- great views of the big baby eaglet by the nest tree -- and we turned to other adventures. The Serra das Araras is very birdy with its mosaic of habitats. I was overwhelmed by a spectacular vulture roost that included a dozen King Vultures [photo on my vulture page], by actually seeing a tinamou (a Tautupa), and by the huge Red-necked Woodpecker. In fact, it was the morning that we walked along an overgrown old road at the edge of the forest seen in the first photo above, toward the woodpecker spot, that suddenly we flushed a giant adult Harpy Eagle from its prey and into an adjacent tree. Having such a large raptor take off out of the grass at such short range is really a shock! Its prey turned out to be a Red Brocket Deer Mazama americana. The eagle was much more interested in getting back down to the deer than it had concern for us. I was able to scurry back to the car, grab my scope, tripod, and camera, and get back to shoot two rolls of film on the adult (a couple of shots are below). If nothing else, just look at the size of those legs and talons! Finally the Harpy got bored of us, and glided off into the forest. We quickly headed the other way -- towards that Red-necked Woodpecker -- in hopes we would give the bird a clear opportunity to come pick up its prey. And it must have done so, because the deer was gone when we returned an hour later.... All in all, it really doesn't get much better than this. For more information on birding Brazil with Paulo Boute or his partners, see their web site.